The great revivals that have swept Argentina in the past number of years started in May 1978 when Dr. Omar Cabrara and I were led of God to conduct a Miracle Crusade in Cordoba. The War was raging, Louis Palau had left and Omar Cabrera was forced to leave when his name was found on a rebel hit list. Omar contacted me in 1977 and plans were made to conduct a major Crusade in Paraguay, but God spoke to me to go to Argentina. Omar was adamant, he did not want to return but I finally convinced him that we should preach there. 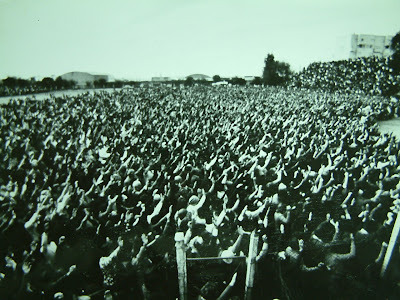 The crusade was a glorious success and on May 15, 1978 we concluded the crusade with 48,000 in attendance. Nuns were tape recording the meetings and there were miracles happening everywhere. Thousands had been converted to Christ and Cordova was on fire for God! A very important key to the Revival was our meeting with the four Colonials who ruled the Cordova District. God led me to ask for a meeting with them and they consented. After being introduced, I immediately began to preach the Gospel to them, pulling no punches. For more than 15 minutes I preached about God and the Devil, Heaven and Hell, Sin and Salvation, the Cross and the Empty Tomb and the Claims of Christ! They were sweating and conviction grabbed a hold of them. The leading Colonial broke in, almost shouting: "What do you want from us? I answered: "Stop persecuting the Evangelicals and the Pentecostals. Stop persecuting Dr. Vaccarro and Omar Cabrera!" He answered, "Okay. What else?" I said: "Get on your knees and repent of your sins?" Omar laughed and they relaxed! I said: "I would like to pray for you and your loved ones." They said, "Of course, please do." The persecution stopped immediately and within 18 months Omar Cabrara had a church with 9,000 members as well as several hundred preachers joining with him across Argentina. A lady who owned a kiosk was healed in our Crusade and hung up her wheel chair and crutches for all her customers to see. She was very well known, having been there been there for 30 years. About 3,000 people visited Omar's New Church because of God's miracle in her body. In 1980 Omar and I conducted a Crusade in Santa Fe where little Julio Diaz was miraculously healed when God gave him new ureters. The Roman Catholic Radio Station and their Weekly Magazine interviewed Omar and me as well as Julio's mother and father. They said, "This miracle is too great for only the Evangelicals. We Catholics also must see what God is doing." And I heartily agree! Some time later, Carlos Anacandea got converted and several millions have been saved through his Ministry and that of other Pentecostal Evangelists. We give God all the glory! Our Saviour went to the cities and villages. He didn’t only go where there were large crowds. He declared the Good News of the Kingdom of God. He brought peace, forgiveness, divine healing and new life to them. The Lord was moved with COMPASSION when He saw the great needs among the multitudes of hurting people. He recognized the need for pastors who would love the people and minister to them as He did. He stressed the importance of gathering in the harvest of precious souls for His Kingdom! Almighty God promised to give His Son the heathen for His inheritance. To fulfill that promise, Jesus Christ was incarnated and took upon Himself human flesh in order to suffer, bleed and die for the redemption of the human race and to rise again in power and great glory! After 3 ½ years of preaching and healing the sick, casting out demons and bringing deliverance and salvation to multitudes, He was crucified on a “the cross of shame” to satisfy the demands of divine justice. On the third day, Jesus Christ rose from the dead, thereby defeating sin, death, hell and Satan! We hold the KEY to that prayer being answered! GOD HAS LAID UPON THE CHURCH! Jesus confirmed the importance of His Ministry, which we have been called to continue in His absence. He commands us to be filled with the Holy Spirit and to take His miracle-working Gospel, His never-changing Word, His supernatural Power and His incomparable, life-giving Name throughout the entire world spreading love, joy, peace and divine healing! FIVE THINGS WE MUST DO TO FULFILL THE FATHER’S PROMISE: 1. Pray for labourers; 2. Ask God to give us love for all believers; 3. Open our eyes to see the whitened harvest fields; 4. Receive the Blessed Holy Spirit and His leading in our lives; 5. Carry Christ’s glorious gospel everywhere possible and in the power of His Name deliver lost humanity! By God’s grace we will do it for His honour and glory! Amen.